You don't need to be an experienced builder to construct your own sawbuck, just follow the plans. Plus, the plans make building the sawbuck quick. In fact, a majority of people can complete the project in about 1-2 hours, making it the perfect weekend project. The only thing you need to supply are a few common household tools, outdoor screws, bolts/nuts from your local hardware store and 5 treated 2x4's. Plus a 30 day money back guarantee! If you're not completely satisfied with these plans for any reason we'll refund your total purchase price. After your payment, we will email you with a link to download the assembly instructions. 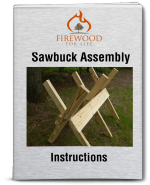 The sawbuck assembly instructions make building your own folding sawbuck quick and easy. 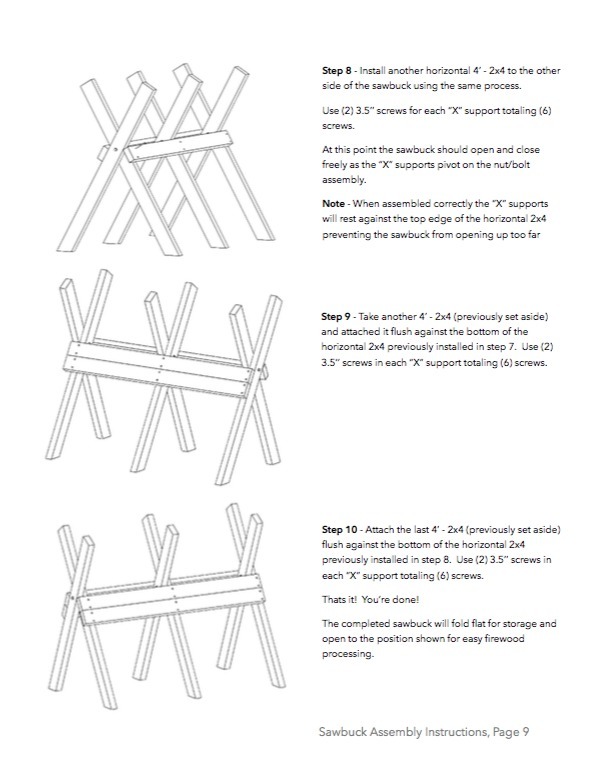 Plus, after you download the instructions you can print them off and take them with you to build the sawbuck. The average assembly time is usually about 1-2 hours. Whether you cut a lot of firewood to heat your home or just enough for a few campfires, a sawbuck makes cutting firewood safer and easier. 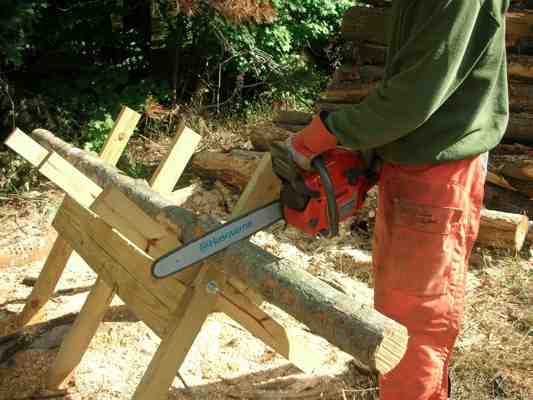 A sawbuck is designed to hold long pieces of wood off the ground so they can be cut into smaller, more useable pieces. Cutting firewood at waist level is not only easier on your back, but it prevents your sharp chainsaw chain from running into the ground. If you've ever cut firewood before you know it's frustrating to have a fresh, sharp chain hit the dirt and become instantly dull. With a sawbuck you won't have to worry about it anymore! Depending on the size of the limbs or logs, the sawbuck can hold multiple pieces of wood allowing you to cut several limbs at once. Just load the limbs into the large "V" shaped opening and make one cut. Do you cut your firewood to a specific length? The evenly spaced support legs on the sawbuck serve as a guide allowing you cut your firewood into similar length pieces. The sawbuck also works great for processing large semi loads of firewood into smaller pieces as shown in the picture above. Our sawbuck assembly instructions contain easy to follow, step by step instructions with 3D illustrations making it simple for anyone to build a sawbuck. Our sawbuck design has been the most popular do-it-yourself sawbuck on the internet for several years and it's still growing in popularity. Our 10 page instruction booklet containing pictures and 3D illustrations walking you through every step of the building process. Just follow the steps and you can build your sawbuck in about 1-2 hours. The only thing you need are a few household tools, screws, bolts/nuts and 5 treated 2x4's. Don't worry, the instructions explain exactly what size screws, bolts, washers and nuts you will need so finding them at your local home improvement store is quick and easy. If you have access to a few tools and you have 1-2 hours of spare time you can build this sawbuck. Quit cutting firewood in the dirt! 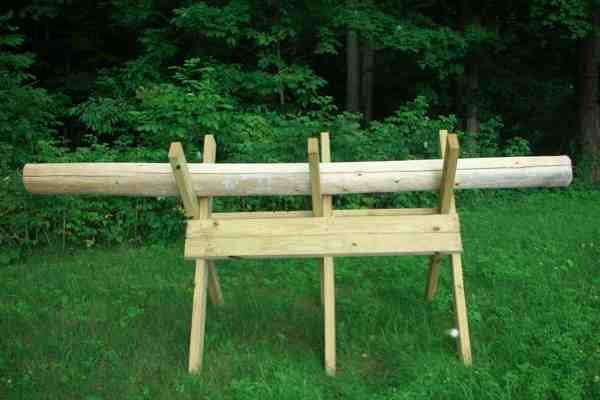 Save your back and cut firewood on a sawbuck! Our sawbuck is rugged, strong, durable and it folds flat for easy storage.